There is no better bread. The need of a loaf which has the advantages of white and brown bread is fully met in 'Bermaline.' Its delicious flavour and easy digestibility attracts every appetite. Start eating 'Bermaline' to-day. Is it still made in the UK? I well remember my Mum buying it from 'The Tudor Cafe' in Sevenoaks in the mid to late 60's. Used to love the flavour and did manage to find the flour when the cafe shut down but all a long time ago now, sad to say. This really was my favourite bread ! Where can it be purchased now ? I had never heard of Bermaline bread but recently brought a thimble advertising it. It looks good! In the 1950s, when the baker still came to the house with a basket full of his various loaves, Bermaline was one of my favourites. My mother bought it from time to time, and I loved the taste and the texture. I don't suppose it's available anywhere now - there are few people who have ever heard of it. The comment below about its lack of popular appeal suggests the reason it was discontinued, though I don't know when that was. My father was a baker in Exmouth, Devon, from 1935 to the 1960's. From about the age of 10 to 16 I used to help him in his bakery as well as being the delivery boy! My younger brother also did his bit. I remember he baked BERMALINE. I have a strong memory of it for its very distinctive shape and the embossed name on the side. It was sold with a little paper band around it. Did its invention have anything to do with providing a tastier alternative to the "national Loaf" of 2nd World War time? It was a wholemeal loaf and was not at all popular. 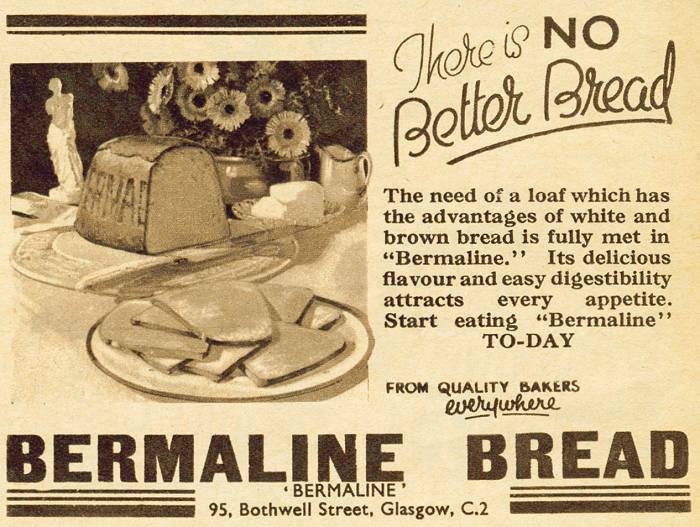 I don't remember Bermaline still being baked by Dad by the mid-to-late 1950's. sounds good, looks good, but how do I get the recipe.also soldier cake,can you help please.